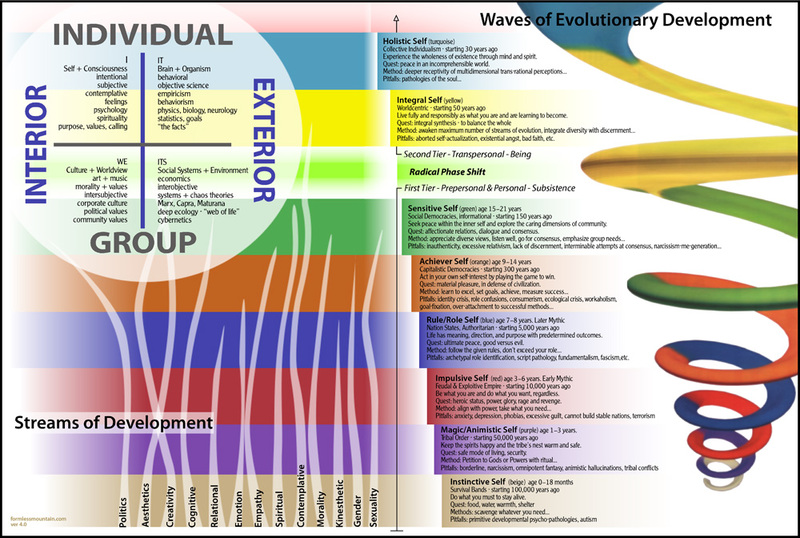 The above charts include the human developmental life-stage models of Eric Erikson, Carl Jung, Abraham Maslow, Chris Cowen, Don Beck and Ken Wilber. Many others have constructed similar models that suggest that: (1) human experience involves a variety of developmental tasks; (2) that we encounter these developmental tasks in a series of life-stages; (3) that our developmental tasks and life-stages occur within difference domains of knowledge and dimensions of experience. 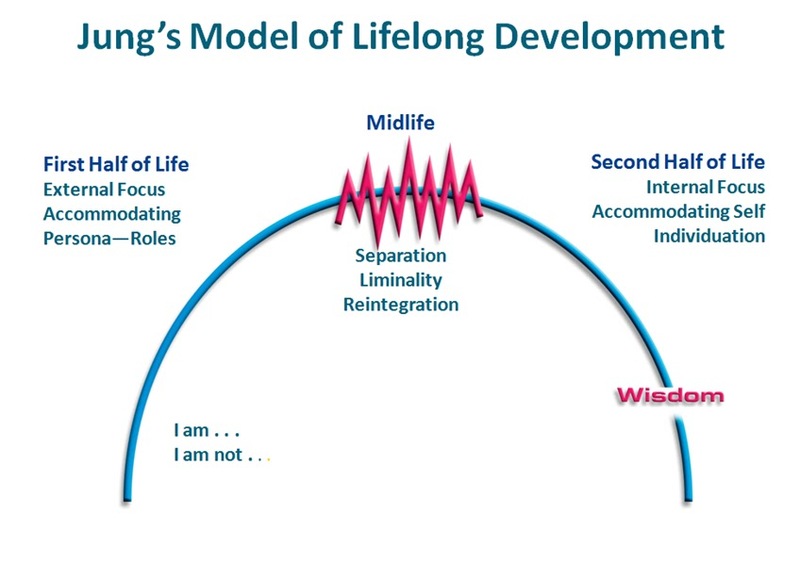 All of this relates to my most recent blog on the developmental task of “saging” within the “senior years” after we have completed the earlier life-stages associated with childhood, adolescence, young adulthood (marriage and family) and mid-life (employment and career). Each life-stage presents us with new existential questions and new challenges to change and grow. In Jung’s model the second half of life involves a shift from our outward “persona” within various social roles to our inward personage as a self-reflective human being. 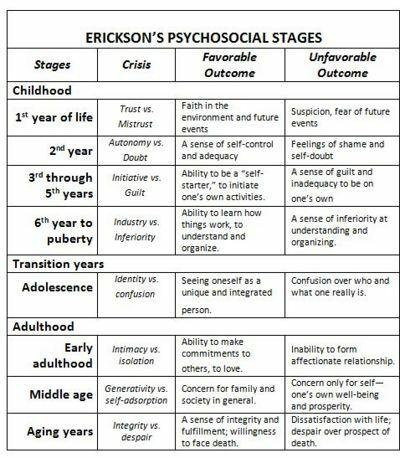 Eric Ericson views the later developmental stages as involving Generativity and Integrity. 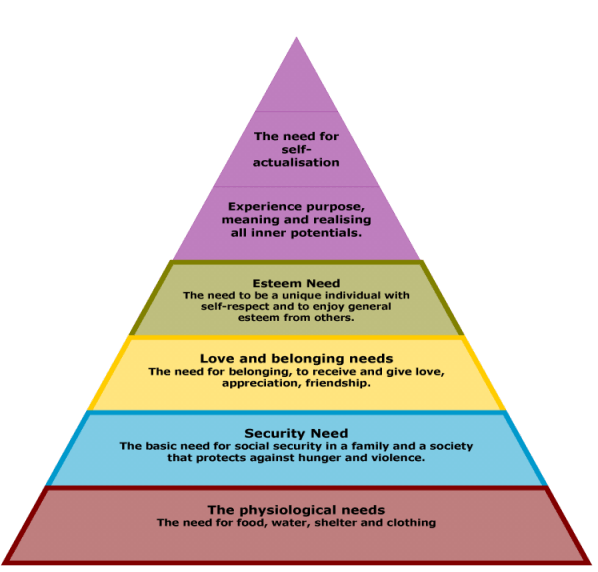 Abraham Maslow views the higher developmental tasks as involving our ontological “Being needs” for self-actualization and self-transcendence beyond the meeting of our basic “deficiency needs” for survival, security, belonging, achievement and status. 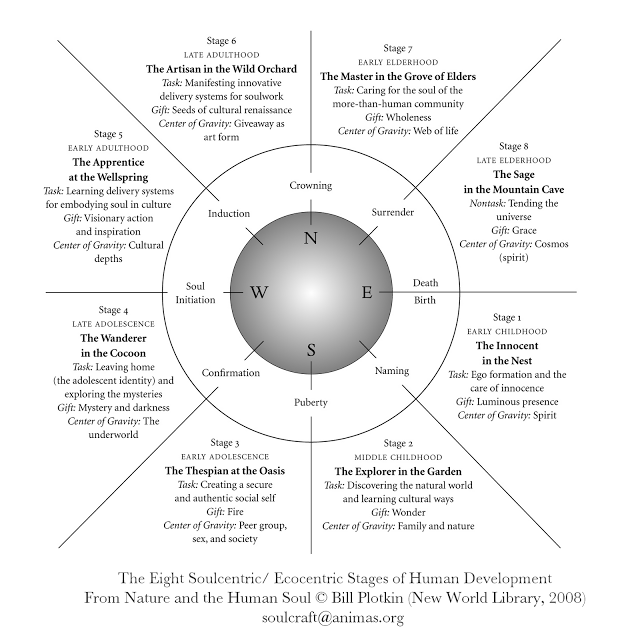 In the Spiral Dynamics model we have second tier developmental needs for Integration and Wholeness beyond first tier preoccupations. These represent cultural memes and ascending waves of evolutionary development. 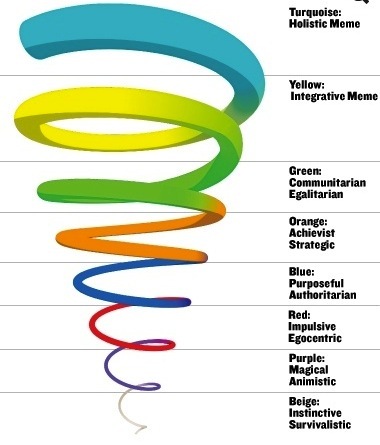 Ken Wilber places these emergent Spiral Dynamics within the context of his “All Quadrants, All Levels” (AQAL) “integral model” that includes the Internal, External, Individual and Collective dimensions of life. As human beings we may become fixated upon any of the life stage developmental tasks so that we ignore everything else or refuse to travel the rest of the journey. We see this with individuals in their 20s and 30s or even their 40s who are still living the developmental tasks associated with adolescence or the teen years. We see it with some persons in their 60s who are attempting to repeatedly re-live the first half of their lives all over again in the American cult of perpetual youth rather than gracefully grow in wisdom, maturity, wholeness and integration. Each life-stage and developmental task has a beauty and charm as well as a difficulty and perplexity that is all its own, and the best thing we can do is to embrace the gift and challenge of each new task rather than life in the past. One thing I’ve discovered about the aging (and saging) process is that I have become more clear in my own mind and resolved in my own heart about those “simple things” in life that I most deeply cherish and savor. “My Favorite Things” include the rising of the sun, the romance of the moon, the stillness of the night, the bird song of the morning, the dew upon the earth, the contemplation of being, the mystery of life, the quest for wisdom, the wonder of the cosmos, the grandeur of nature, the scent of flowers, the therapy of water, the power of music, the magic of art, the grace of movement, the elegance of dance, the treasure of books, the enchantment of poetry, the delight of humor, the deliciousness of food, the refreshment of drink, the sensuality of the body, the nobility of the mind, the cultivation of literacy, the practice of civility, the reverence for life, the empathy of compassion, the bow of admiration, the embrace of affection, the gift of friendship, the courage of leadership, the commitment to service, the sharing of community, and the joy of celebration. One can cultivate “a simple and quiet life” of inward gratitude and serenity and of outward kindness and hospitality as the crowning achievement of the journey into wholeness. Much to my own astonishment I’m now 68 years of age, in that post-retirement life-stage that is sometimes politely called senior adulthood, elderhood, graceful aging, or “saging.” I enjoy spending much of my time reflecting, reading, writing, relaxing, listening to music, appreciating nature, beauty and art, sauntering outdoors, watching movies, going to occasional plays and concerts, eating out, dining in, and enjoying stimulating conversations with friends. For several years now I’ve been retired while my wife continues to work, and so I’ve needed to find creative ways to occupy myself each day while she continues to march off each day to serve others as a dedicated nurse assisting kids with severe physical and mental disabilities. I’ve had to come to terms with the “invisibility” and “disposability” of retirement. After a life time serving in a rather visible hybrid vocation in ministry, education and counseling, being retired has mean that I have no natural platform or forum from which to address and engage others. I have needed to discover and create a new series of venues for continuing conversations to take place. Besides writing in my blog from time to time I enjoy periodically teaching adult seminars at the Osher Life-Long Learning Institute associated with Southern Oregon University, along with hosting a monthly Villa Sophia conversational salon, starting men’s growth group, and now, launching a monthly book discussion group. It’s a good life! Recently I had coffee with a younger adult, a delightful younger person in her late 30s whose life is quite busy and full with working, going back to school, raising a teen age son, supporting her mother who lives with her, and starting to date someone new after another relationship ended some time ago. She thinks she might like to pursue a career in counseling. Other than assigned reading for school classes, she presently has no time for reading for pleasure and personal enrichment. While I am empathic of her situation, I must admit that it is quite alien to where I find myself at this season of my life. If I have any primary focus right now it is the cultivation of wisdom and the enrichment of friendship. I’ve completed those other life-tasks like school, work, dating and parenting years ago and have no desire to re-visit them. What struck me in all this is the truism that we each live through different seasons of life. 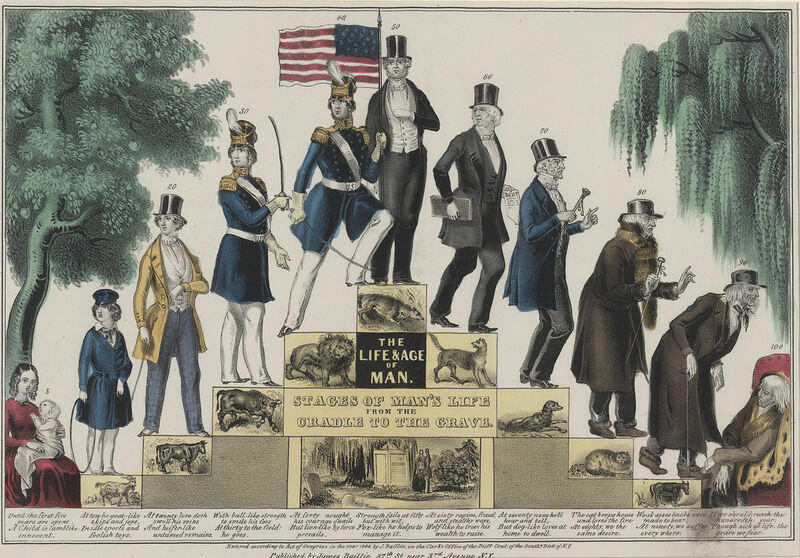 Of course there are many other factors in play that influence and shape us during each life passage, including our family background, life experiences, personal relationships, psychological temperament, educational experiences, work history, worldview perspective, and lifestyle choices. But none of this changes the fact that we live through difference seasons of life. In the most simple of terms, we pass through the process of birth, infancy, childhood, youth, early adulthood, mid-life, elderhood, aging, infirmity and death. It is the common human condition, the universal sojourn. 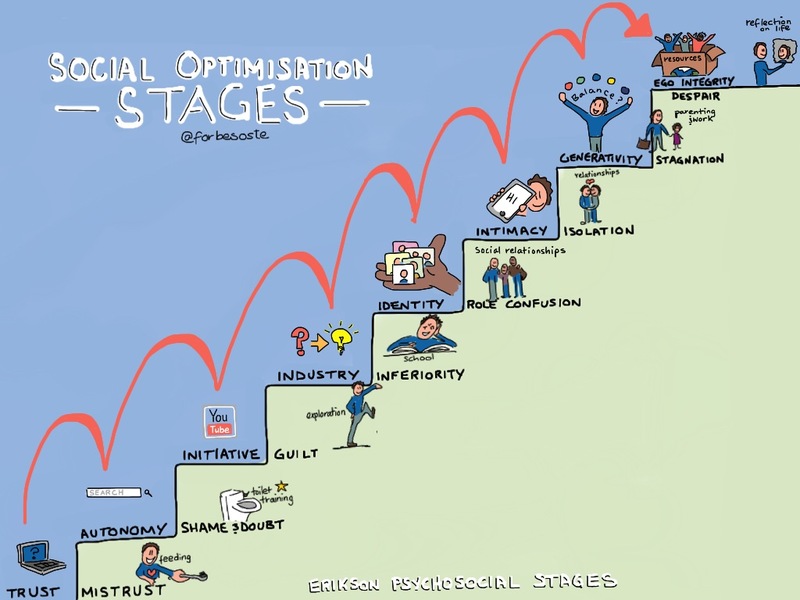 How we navigate these various life-stages is a matter of personal courage, resourcefulness, intelligence and creativity. For the past several years now I’ve been coping with an autoimmune disease known as poly-mialgia-rheumatica, or PRM, and I must say it has crimped my style. I’ve had lots of medical consultation and have adopted a non-inflammatory diet, among other healthy choices, but PRM doesn’t just go away. I’ve learned that I may have to dance with it for the rest of my life. It makes me extremely weak, aching and tired at times with flu-like symptoms. Some days I have no energy to do anything at all. You say, “Well Rich, welcome to the human race.” And you would be right. Countless people deal with chronic illnesses, especially those who are getting along in years. I think that at some point we choose to do everything we can to take care of our health, to live pro-actively, and address any potential causes of illness. But at the same time we learn to accept life as it comes to us from day to day, and especially to savor those special moments in which we experience wonder and beauty, grandeur and tenderness in the midst of the ordinary stream of life. And we learn to meet ourselves half-way. What matters the most to me these days is two-fold: Wisdom and Friendship. I value the continued cultivation of the integral life of the heart and mind. For me this means a continuing journey of reflection and discovery as I explore various personal dimensions, life systems, historical ages, human civilizations, worldview perspectives and intellectual disciplines. And for me this also means enjoying the friends of a small circle of fellow travelers with whom we mutually share each other’s suffering and joy, wisdom and experience as we explore “The Great Conversation” together.